PJH:3766 wrote: This TV western is a spin-off of a radio show of the same name. The radio series broadcast 2,956 episodes from 1933-1954. The 30 minute TV show ran from 1949 – 1957 and 221 episodes were produced. It was broadcast on ABC Thursday evenings at 7:30 EST and was filmed in black and white for the first seven years and in color during its last year of production. This show was in syndication for years—and is most likely being shown somewhere in the world right now. This spin-off is the first and probably most famous children’s TV western series ever produced. The early baby boomers grew up watching this show, believing in the hero’s creed, and eating General Mills cereals and Tootsie Rolls (two of the sponsors). There was a great deal of merchandising for this show---books, records, comic strip/comic books, lunch boxes, costumes, toy guns with twin holsters, etc. The hero is a former Texas Ranger who travels the American Southwest righting injustices and helping the weak and innocent. He is accompanied by another man whom he rescued from near death when they were both boys in their teens. At the start of this series, they are reunited and the friend returns the favor by nursing the hero back to life. After the first three episodes (that provide the back-story for this series) we never hear the hero’s real name mentioned again. The star of this series was absent from the show from 1952-1954 due to wage disputes and creative differences. He was invited back because his replacement was never accepted by loyal viewers (you can’t fool kids). The producers actually thought the viewers wouldn’t care about the change in actors! The star of this show was forever identified as the character he played. He made personal appearances as this character right up until his death in 1999 and baby boomers loved every minute of it. Who can answer any or all of these questions? 1. What is the name of this children’s TV western show? 2. Who is the actor who played the lead? 3. What is his horse’s name? 4. What are his two trademarks? 5. What is the companion’s name and who plays him? 6. What is his horse’s name? Michelle P.:3784 wrote: Well, I know Gunsmoke started out as a radio show, but it wasn't a Children television show. And I know Lone Ranger would be considered a children't tv show, but I don't think it was a radio show, was it??? My limited knowledge of TV Westerns, though I'm getting more knowledgeable every day, would take a wild shot at The Lone Ranger. PJH:3800 wrote: "Return with us now to those thrilling days of yesteryear. The Lone Ranger rides again!!" Congratulations to Michele for correctly identifying TV Western Spin-off #11 as The Lone Ranger. The Lone Ranger began as a local Detroit radio program in 1933 (2,956 episodes) and later moved to network radio. (Hear actual radio broadcasts—the link is at the very end of this post) Fran Striker was the writer who created this most memorable western hero. He wrote a set of guidelines for this character and put in place a strict moral code by which he lived and these were evident in the radio show and the TV series. 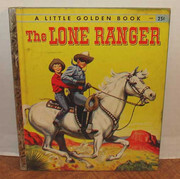 Fran Striker took very seriously the fact that The Lone Ranger was a role model for children. Captain Dan Reid was one of six Texas Rangers chasing the villainous Cavendish Gang. They were ambushed and only one, lone ranger survived---the captain’s brother, John Reid (Clayton Moore). Seriously hurt, Reid is discovered by an Indian named Tonto (Jay Silverheels), who recognizes Reid as his boyhood friend who once saved his life. Tonto nurses the ranger back to life and vows to support him in his quest to capture the Cavendish gang and then to continue fighting injustice throughout the west. After the first three episodes, the Lone Ranger was never referred to again by his real name, John Reid. In fact, all of the subsequent episodes end with one of the characters asking, “Who was that masked man?” and another answering, “Why, that was the Lone Ranger”. The first 78 episodes were produced and broadcast for 78 consecutive weeks without any breaks or reruns (remember this was 1949 and the 39 episode format of the 1950s was not yet established, let alone the 18-24 episode season of today). The entire 78 episodes were shown again before any new episodes were produced. When it came time to produce another 52 episodes there was a wage dispute with Clayton Moore and John Hart was hired to replace him. Once again 52 episodes were aired in sequence, followed by 52 weeks of rerunning them. Despite the expectations that the mask would make the switch in actors workable, Hart was not accepted in the role and his episodes were not seen again until the 1980s. By this time, The Lone Ranger had been on the air for 6 years. The show was then sold to Jack Wrather who immediately brought Clayton Moore back and another 52 episodes were produced and broadcast as a year of new shows, and then a year of reruns. The final season saw two changes. Only 39 episodes were produced (the accepted industry standard by this time) and Wrather invested his own money to have the shows filmed in color. The Lone Ranger conducted himself by a strict moral code in the radio show, the TV series, the movies, comics, etc. This code was put in place by Fran Striker at the inception of the character. That this government of the people, by the people, and for the people' shall live always. That all things change, but truth, and that truth alone, lives on forever. A 1981 movie, the Legend of the Lone Ranger, upset fans tremendously when the movie studio won a lawsuit prohibiting Clayton More from making appearances as the Lone Ranger. Moore, wearing large sunglasses instead of the mask was interviewed on news shows across the country and gained more publicity than the film. The movie was a spectacular failure for many reasons---adverse publicity around the lawsuit, ignoring and changing much of the existing background material which is considered cannon by fans, and the general poor performance of the lead actor (his dialog had to be overdubbed by James Keach). After the failure of the movie, Moore was allowed to go back to wearing the full trappings of the character and making appearances as the Lone Ranger, which he did for the rest of his life. Clayton Moore (1914-1999) grew up in Illinois and worked in a circus as an acrobat at the age of eight. He worked his way up to aerialist and appeared in the 1934 World’s Fair. He then went to NYC where he found work as a male model and in 1938 was in Hollywood as a bit player and stuntman. He appeared in B movies before joining the army in WWII. After the war, he concentrated on supporting roles in westerns, until he was signed for The Lone Ranger in 1949. Clayton Moore was inducted into the Hall of Great Western Performers of the National Cowboy Western Heritage Museum in 1990 and was give the Golden Boot Founders Award in 1998. Jay Silverheels (1212 -1980) was born on a reservation in Canada to a Mohawk chief. He was a star lacrosse player and boxer before he entered films as a stuntman in 1938. He worked in a number of films before gaining notice in the Humphrey Bogart movie, Key Largo (1948). In 1949 he worked with another B actor, Clayton Moore in The Cowboy and the Indians, and then was signed for The Lone Ranger. He appeared several times, in later years, on talk and variety shows performing his own poetry. Silverheels became an outspoken advocate for Indian rights, as well as a respected teacher within the Indian acting community. He began a second career as a harness racer until poor health forced him to stop. Jay Silverheels was inducted into the Hall of Great Western Performers of the National Cowboy and Western Heritage Museum in 1993. He was given the Golden Boot Award in Memoriam in 1990. 1.The theme music was the “cavalry charge” finale of Rossini’s William Tell Overture, now inseparably associated with the series. The other music played during the show was also classical, since it was in the public domain and helped keep production costs down. 2. Tonto calls the Lone Ranger, ke-mo sah-bee, a word that meant “trusty scout “or "faithful friend" in his tribe's language. 3. The Lone Ranger got his money from a secret silver mine he owned. It was run by Jim Blaine (Ralph Littlefield).The mine was also the source of his trademark, silver bullets. 4. The Lone Ranger’s nephew, Dan Reid (son of Capt. Dan Reid) was played by Chuck Courtney. He appeared in 14 episodes from 1950-55 and rode a white stallion named Victor. The nephew was also a character in the radio series and inspired a spin-off called The Green Hornet. Britt Reid (the Green Hornet) was the son of the Lone Ranger’s nephew, Dan. 5. Silver Cup Bread was one of the original sponsors of the radio show. That is why the Lone Ranger used silver bullets and the horse was named Silver. 6. Gerald Mohr was the initial announcer/narrator for the TV series. He also narrated seven episodes of the radio series. Fred Foy served as narrator of the radio series and then as announcer on the TV series, once the narration was dropped. 7. Clayton Moore recalls, in his autobiography, watching the studio burn the original master film from the two Lone Ranger movie serials that were produced in 1938 and 1939. Only Spanish-subtitled dupe prints survived. Luckily the Serial Squadron, an organization which restores classic movie serials, reconstructed an English digital video version of the serials in 2007. 9.The widespread popularity and admiration of the radio and TV series lent itself to inevitable parodies and takeoffs in cartoons and other popular media. Clayton Moore and Jay Silverheels were not above joining in the fun, playing their own characters in TV ads from time to time, for modern products such as Aqua-Velva after shave lotion and Amoco Silver gasoline and Jeno's Pizza Rolls (who were using his theme). Podcasts of radio shows—click on the little green box in the lower left of each episode box. The original three episodes that provide the back story---the film is old and not always synched with the sound, but well worth watching. •The Lone Ranger is never seen without his mask or a disguise. •With emphasis on logic, The Lone Ranger is never captured or held for any length of time by lawmen, avoiding his being unmasked. •At all times, The Lone Ranger uses perfect grammar and precise speech completely devoid of slang and colloquial phrases. •When he has to use guns, The Lone Ranger never shoots to kill, but rather only to disarm his opponent as painlessly as possible. •Logically, too, The Lone Ranger never wins against hopeless odds; i.e., he is never seen escaping from a barrage of bullets merely by riding into the horizon. •Even though The Lone Ranger offers his aid to individuals or small groups, the ultimate objective of his story is to imply that their benefit is only a by-product of a greater achievement -- the development of the West or our Country. His adversaries are usually groups whose power is such that large areas are at stake. •All adversaries are American to avoid criticism from minority groups. •Names of unsympathetic characters are carefully chosen, avoiding the use of two names as much as possible to avoid even further vicarious association. More often than not, a single nickname is selected. •The Lone Ranger does not drink or smoke, and saloon scenes are usually interpreted as cafes with waiters and food instead of bartenders and liquor. cowgirl:3812 wrote: WOW! What a nice spread you did on The Lone Ranger PJH! Thanks for posting! I am getting these radio shows in the next couple of weeks, when I get them, I'll see about loading one. I use to love this show as a kid and still do today. Remember when the Wrather Corporation forbid him from appearing as The Lone Ranger and from wearing the mask, Clayton Moore put on a pair of Foster Grants and he was still The Lone Ranger. "Who was that Masked Man behind those Foster Grants?" I remember this. I thought what is the big deal, let this man wear the mask, he is "THE LONE RANGER!" Dianna:4103 wrote: I second everything said above. Just want to say PJ, I love seeing all this great material you post.Thanks. Thanks so much for your very positive feedback. I love researching these shows and must admit that lots of the information comes from my memory, since I am old enough to have watched many of these shows. It's very rewarding to know that folks enjoy reading these articles.